If you’re like most actors, you at least occasionally turn on the television to see what’s popular. It’s a good idea to keep abreast of what’s successful in the world of showbiz. So, let me ask you a rather blunt question: When you turn on your tele, do you see the most talented actors in the world? Would you say that all the actors on those programs are the most deeply gifted and skilled practitioners of the dramatic arts that the UK has to offer? I won’t name the names of any individual actors, but all you have to do is turn on your television to see that acting talent does not necessarily equal acting success. So, how did these actors succeed while more talented actors failed? Why do less talented actors make it while many talented actors languish in obscurity? Based on my decades of experience as an actor, acting coach and industry insider, I can tell you that the main reason these actors “made it” was because they were able to avoid the “Dangerous Trends” that I discuss in this report. If you’re a struggling actor with a 9 to 5 job, and you’re not the most talented actor in the world, by all means, get the best training you can to develop your talent. BUT, remember, these trends can take down even the most talented actor. One of the most dangerous trends that people fall into when they start working a 9 to 5 job is that they fall into the work-a-day routine of wake up, shower, ride the tube to work, work an mind-numbing 7 hours, come home, collapse in front of the tele, fall asleep and then do it all over again the next day. People in a 9 to 5 job very quickly start to believe that this is what life is supposed to be like. They look around and see everyone else doing exactly the same thing and they begin to accept it as “normal”. They stop living. Why is this such a danger for an aspiring actor? ENERGY. I’ve worked with countless casting directors over the years and the one thing they tell me they look for…more than talent, more than training, more than experience, more than anything…is ENERGY. And people who have allowed the 9 to 5 routine to sap them of life, do NOT exude that vital, vibrant energy that every actor must exude to wow a casting director. No energy = No success. Many actors working a 9 to 5 job can begin to feel disappointed and discouraged that they are not living out their acting dreams. They feel they’ve had to compromise by getting a “day job” while they pursue their acting career. As the weeks and months go on, these emotions of disappointment and fear and depression can become quite painful. They develop a pattern of systematically numbing their pain. They disconnect from their emotions. And the saddest part is that it’s impossible to selectively numb. When you numb from pain, you also numb from good feelings like joy. When you numb, you become less able to connect to any emotion whatsoever. It’s simple. You cannot give a great acting performance without the ability to connect with your emotions. The greatest actors, from Marlon Brando to Meryl Streep, are actors who are able to tap into their own emotions at a deep level. Every time you numb out, you’re dealing a blow to your acting potential. This trend is closely related to Trend #2. As the grind of the 9 to 5 starts to wear on them, many actors turn to food, drink and drugs in an attempt to feel pleasure and avoid pain. saying that all drink and food are bad for you. But some actors in a 9 to 5 profession lose sight of what is healthy and what is an addictive, harmful habit. Again, it’s quite simple: The more time an actor spends in “false” feelings, the more difficult it is for him to express genuine feelings and emotions in his performances. Dangerous Trend #4 The Live The Life Others Want Them to Live. Early in my life, I worked at a bank because my mother thought it was a safe, conservative career for me. It pleased her to think that her son worked in such a “secure” industry like banking. And I thought it was the best idea for me too! The problem was that I had zero passion for the industry. I was only working there to please someone else. And it drove me crazy. Had I stayed, I’m sure I’d be the most miserable person in all of London. Many of us think that pleasing others and taking the “safe” way is the best path, when it’s actually the worst. The most fulfilled people are people who’ve taken risks to pursue their passions. The easy road is never the most fulfilling. Because you cannot become a great actor without taking risks and overcoming fear. The greatest actors are unpredictable. They take risks in their personal lives and that better equips them to take risks in their performances. Dangerous Trend #5 : They Become Fearful and Stay Stuck. All of these trends lead directly to the culminating, and most fatal trend of all: developing a HABIT of fear and paralysis. Any “9 to 5” actor who falls into a routine, numbs out, seeks pleasure in unhealthy habits, and lives for others (rather than herself), will inevitably become irredeemably STUCK where she is. You see, what you achieve in life is, to a large degree, a result of the habits you develop. If you develop a habit of escaping, numbing and abdicating responsibility for you life, your achievements will reflect that. Great actors are fearless. Period. If you let fear paralyze you, you’ll never achieve great performances, or acting success. you energy and energy is GOLD in acting. experience the emotions, both good and bad, that these new situations bring up. 3. Design Fun Into Your Life. What is fun to you? What is your definition of “fun”? Write it down. Get VERY clear about the kind of life you want. We’re only here for a short period of time. Don’t waste it. 4. Take Risks. Start small. Once you get in the habit of it, you’ll love it and want more. not count. Ask yourself, “How many genuinely intimate connections did I have today? 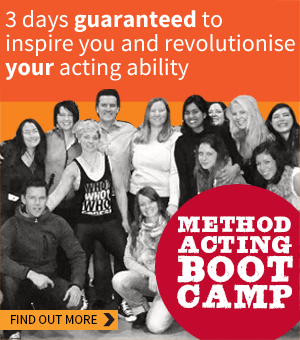 One simple step that you can take right now, that would incorporate all 5 of these tips above, would be to apply for my Introduction to Method Acting Boot Camp.